Erasmus Student Network (ESN) is an organisation that helps international students enjoy their stay abroad. With a new upcoming semester, there are several events planned by ESN Molde. ESN organize events during the entire semester to help international students integrate and make their stay in Molde enjoyable and full of unforgettable memories. However, their events are not only for international students. “ESN events are organized for everyone, we want to involve both Norwegian and international students. 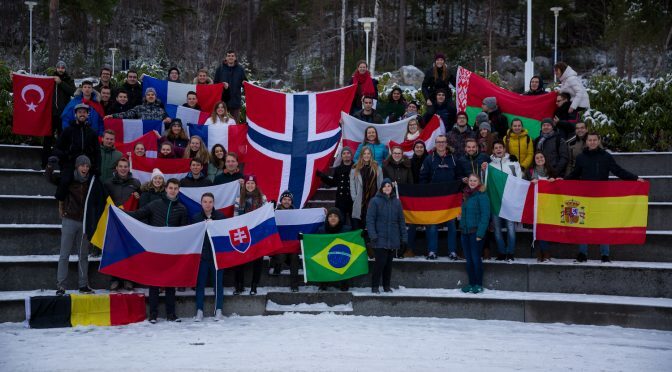 Norwegians are the best help international students can have to get integrated, and explore Norwegian culture and the language,” says the president of ESN Molde, Timothy Nemytov. ESN also organize smaller, regular events at school as board games evenings and movie nights. It is a great opportunity for the students to gather and get to know each other. There are also several sports events planned. For those, who would be interested in joining ESN, there will recruitment for new members going on from 25th January till 4th of February. During the last week of January ESN is going to present their organization and what they do. “We would like to have more Norwegians students involved, as they know their country the best and only they can show us international students their country the best,” says Timothy. If you are interested to become a member of ESN, do not hestitate to contact the president of the organization Timothy Nemytov or vice president Nikola Krahulcova. You can find more information about ESN and their events on their Facebook page.